Off the eastern coast of Madagascar in the middle of the Indian Ocean lies the island of Mauritius. While the small republic may be renowned for its saturated blue waters and myriad nature reserves, it recently caught our eye for a slightly different case: the opening of SALT of Palmar, an immaculately designed hotel that’s rife with inspiration. 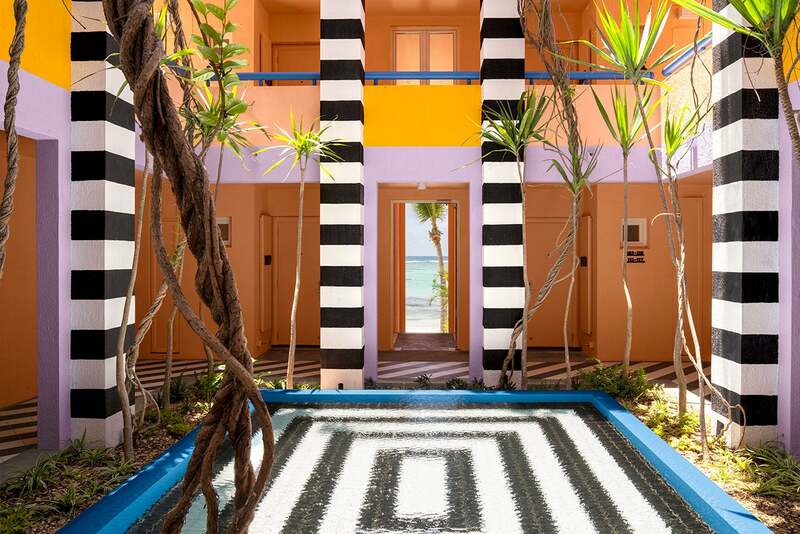 The picturesque landscape aside, the major draw here is the aesthetic of the resort, conceived by none other than the wildly inspiring London-based designer Camille Walala. Known for her unapologetic approach to color and eccentric use of pattern, Walala held nothing back when it came to this particular project. Walala’s chromatically inclined take on the design is fueled by her distinct eye for mixing patterns with unexpected tonal pairings, coupled with a strong influence of Memphis style. The result is a captivating destination that’s artful while also fitting in effortlessly with its natural surround. Read on to explore the boldly colorful hotel and what we took away from it. While it’s difficult to single out one specific feature that could reign as the crowning moment of the establishment, the hotel’s riad might just take the cake. Its distinguishing mark is a toss-up between the black-and-white striped pillars and the saturated slew of pastels that deck the walls of the interior. Accented slivers of Yves Klein blue are thoughtfully woven throughout, forming a sense of cohesiveness between the contrasting hues of the palette. Continuing on with the peach-toned scheme of the establishment, the hotel bar calls for the opportunity for an added dose of contrasting colors. Splashes of teal are coupled with bright blues and pops of coral beautifully juxtaposed with the vibrancy of the black-and-white striped detailing continued throughout. The bedrooms function as sort of a reprieve from the abundance of color found within the hotel. With its white walls and matching bedding to boot, you’ll find only a handful of hues within the rooms. In turn, this calls for the opportunity for the surrounding landscape of the island to play to the chromatic motif of the hotel. Square red tiles displayed in a gridded format offer a refreshing take on the standard application, bringing with it a striking color detail that’s minimalist yet impactful. Matte black fixtures lend an added layer of drama. Outdoors, the signature palette continues, where a pared-down approach to the decor is offset by the unique color pairing of the cool blue lounge and the decorative layers on top. Inspired? See the pieces we’ll be using to re-create Walala’s dramatic vibes at home. With its striking blue shade and contemporary form, this artful rendition of the decor staple promises modern elegance with a touch of sensibility. A captivating pattern transforms this sculptural decor essential into a statement-worthy accent in its own right. Proving that there’s hardly anything snoozy about a black-and-white combo. The sleek two-tone finish of these contemporary pieces mirrors the unique color combinations found within the hotel. Think of it as a foolproof approach to dipping your toes into decorating with a bold splash of color. In true Memphis fashion, this accent piece combines color and pattern with a dose of effortless cool. Channel the hotel’s vibrant pops of yellow by bringing home a decorative accent that can emulate a similar effect. This vibrantly colorful piece will do the trick.